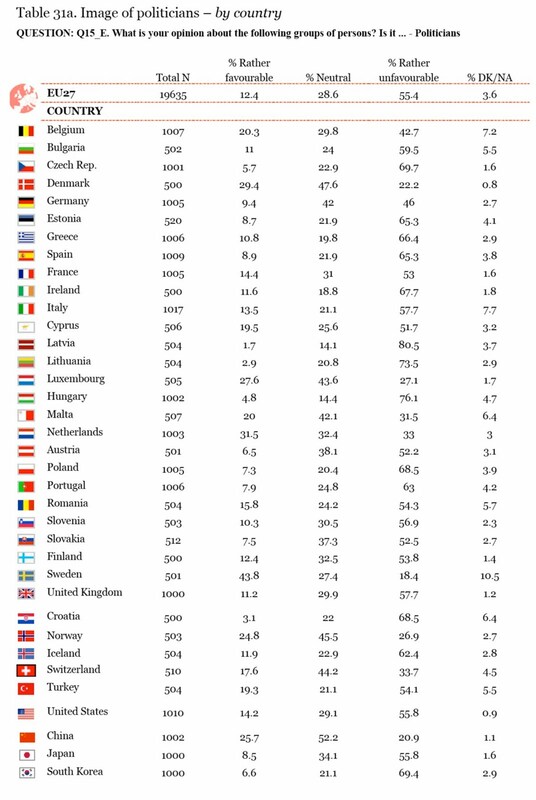 Thanks to Gerard O'Neill of Turbulence Ahead for publishing yet another of the international comparisons that allow us to see how well – or badly – we are doing compared to other western countries. This one looks at our image of politicians. Needless to say it doesn't include Northern Ireland separately, but it would be surprising if Northern Irish people trusted their politicians any more than the average western European. But one country stands out, as almost always in comparative surveys, no matter what the topic – Sweden. In Sweden 43.8% of people have a 'rather favourable' opinion of their politicians, compared with an EU average of 12.4%. And only 18.4% of Swedes have a 'rather unfavourable' opinion, against the EU average of 55.4%. Swedes are not foolish people, and are no more likely to be fooled by their politicians than anyone else, so what these results show is that Swedish politicians are simply better than any others. If their voters have a positive opinion of them it must be because they are more honest, more diligent, more representative and more efficient than any others. And, of course, good politicians lead to good politics and good governance – and these lead, almost inevitably, to a more responsive state in which the needs of the people are served better than elsewhere. No wonder Sweden is close to the top of the list in almost every international comparison, whether it is looking at freedom, affluence, education, development or happiness. Whatever it is that Swedish politicians are doing, they are doing it well, and their voters are happy with them. We need to learn from them. An article in today's News Letter about the UUP's selection process for next year's Assembly election manages to avoid using two embarrassing words – Tory and UCUNF. Nowhere in the report on the process is there even a hint about whether the UUP will again fight the election in partnership with the Tories, or whether that embarrassing and failed experiment is now firmly in the past. Given the paucity of talent that the Tory part of UCUNF managed to contribute in May, it would be interesting to see if they could find anyone better next year. Some Tory hopefuls will undoubtedly wish the UCUNF 'joint-selection' process to be used, and for the candidates to then stand as 'UCUNF' candidates – otherwise, standing as Tories, they would have almost no chance of being elected to the Assembly. But perhaps the UUP, still the overwhelming majority of the partnership, have decided that the Tories are more of a hindrance than a help. Long one of unionism's bêtes noires, Martin Mansergh – former Senator now TD, and southern Protestant republican – has a letter in today's Irish Times in which he appears to say, in a circuitous way, that constitutional republicanism is an ideology that everyone can and should embrace, "unless one is a unionist". So Mansergh is aiming his message fair and square at the nationalist community in the whole country, but obviously more specifically in the north, and his message appears to be one of ideological unity, if not unity of political parties. There is no democratic, historical or ideological justification, or any basis in international law, unless one is a unionist, for not embracing a constitutional republicanism, now that we have at long last succeeded in creating a foundation for future active cooperation between Protestant, Catholic and Dissenter and other more recent traditions. The original peaceful constitutional ideals of William Drennan in 1791, when the United Irishmen were founded in Belfast, have something that everyone, even unionists, can in part identify with. While I respect the view – which I shared – that equates a free Ireland with a united Ireland, recent developments as a result of the peace process, which give us new freedom to achieve freedom in Ireland as a whole, suggest that we have now taken a broader and more pragmatic view. […] Self-determination, as the term suggests, and as international law prescribes, permits the free choice of more than one outcome. Since Mansergh is seen by unionists as one of Fianna Fáil's key pointmen on the north, these remarks will be interpreted as a significant change of tack by that party, and one that signals a move away from the anti-partitionist, pro-united Ireland rhetoric of the past. It is too soon to tell whether they are right, and, of course, Mansergh's remarks chime with the official post-GFA line, that seeks to give the northern institutions time to 'bed in'. Nonetheless, his remarks appear to be a carefully coded message to both nationalists – saying that republicanism is both right and correct, but only if constitutional – and to unionists, saying that, as far as the southern government is concerned the 'seige' is lifted, but on condition that they also move towards 'republican' ideas of fairness and inclusion (the mention of Protestant United Irishman William Drennan was a clear message). Why Mansergh chose to publish his message now is less obvious. There are no immediate 'crossroads' on the political horizon, and the threat he implicitly invokes – that dissident republicans will hijack the centenary of 1916 – is hardly immediate. Perhaps his message was just part of a slow subtle campaign to mould consciousness north and south in a direction that suits the needs of Fianna Fáil at present. Faced with pressing economic problems to resolve, Fianna Fáil does not want either dissident republican or extreme unionist agitation north of the border to upset its attempts to steer the south back to calmer waters. The results of the 2009 Young Life and Times Survey have recently been published on the ARK web site. The survey is based on questionnaires sent to a sample of 16 year olds and suffers from the unreliability of all such surveys and opinion polls. Nonetheless, with that caveat, the results show up some interesting results. For example, on identity, when asked “Which of these best describes the way you think of yourself?”, only 28% of the sample self-identified as ‘British’, while 36% self-identified as ‘Irish’. The second most popular description, beating British, was ‘Northern Irish’ on 30%. Thus 66% - two in three – young people seem to identify primarily with the island of Ireland, or their particular part of it. Amongst boys the situation is more pronounced than among girls. Only 25% of the boys questioned saw themselves primarily as ‘British’. The ‘Irish’ and ‘Northern Irish’ groups accounted for 68% of the total. Even amongst Protestants only a bare majority – 51% - saw themselves first and foremost as British. Almost as many (40%) saw themselves as ‘Northern Irish’), though the 6% who self-identified as ‘Ulster’ can almost definitely be added to the ‘British’ group. 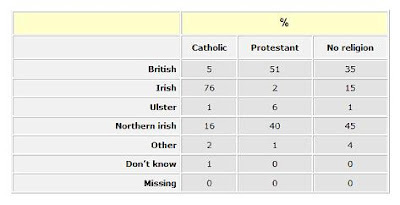 Perhaps unionism can gain some reassurance from the 5% of Catholics who saw themselves as ‘British’ – only partly compensated by the 2% of Protestants who identify as ‘Irish’. However, 76% of Catholics saw themselves as ‘Irish’ – greatly outscoring the Protestant ‘British’ category. The attachment of the two religious groups to their perceived ‘natural identity’ is visibly different – Protestants are less likely to have a primary ‘British’ identity than Catholics are to have a primarily Irish identity. Protestants seem to be moving more towards a ‘Northern Irish’ identity. The results of the wider NILT survey for 2009, due soon, will allow a comparison between the 16 year olds and their parents and grandparents. A second question: “How important is your national identity to you?” adds an interesting twist to the results above. 35% of Catholics say that their national identity is ‘very important’ – the figure for Protestants is only 24%. In fact, 21% of Protestants say that their national identity is ‘not very important’ or ‘not at all important’ – the corresponding figure for Catholics is only 11%. So it seems that amongst 16 year-olds the ‘Irish’ identity is not only more widespread than the ‘British’ identity, but it is also more strongly held. Young Protestants, on the other hand, seem to have a weaker attachment to their Britishness. Remember, these young people, 16 years old in 2009, will be voting next year! The description by others, and by itself, of Sinn Féin as a ‘republican’ party is only partially accurate – and reflects only a minor and unimportant part of that party’s policies. The SDLP wants this generation and those that will follow to live in an Ireland that stands tall in the world as a champion of global justice, environmental protection & sustainable development; an Ireland that stands out as a beacon of hope for peace, democracy, human rights and respect for diversity. Yet the media refer to Sinn Féin as the republican party, and the SDLP as nationalist. The reality is probably the inverse. For 100 years now Sinn Féin has been to the forefront of bringing about change in Ireland. Republicans and Socialists from Constance Markievicz, James Connolly and Liam Mellows to Bobby Sands, Mairéad Farrell and Joe Cahill have brought us closer to our goal of Irish unity and independence. Today’s generation of republicans continue that work. The SDLP’s self-description, though also couched in the context of Irish reunification, talks much more about the type of society that it wishes to see in the new Ireland – and that society is one that is republican in the true sense. Ironically, the aims of republicanism and Irish nationalism are unconnected, despite their popular conflation. It is not necessary to be a nationalist to be a republican – some unionists like Alex Kane are openly republican in relation to the UK constitution – and in almost all practical terms the UK is itself a republic. The residual existence of a largely powerless monarch blinds many in Britain to the fact that their country is a de facto republic. But whether or not the UK complies with 99% of the republican agenda (the other 1% is the monarch and the undemocratic House of Lords), Irish nationalists still do not feel themselves to be a part of it, and continue to aspire to reunite their country as a single democratic republic. In that sense both the SDLP and Sinn Féin are actually nationalist parties, but the SDLP is a republican nationalist party, while Sinn Féin is simply a nationalist party. This distinction is not unimportant. From outside Irish nationalism may look quite monolithic (the famous pan-nationalist front of unionist paranoia), but the reality is that there are as many different and competing strands within nationalism as anywhere else. For many people, while it is important that Ireland is reunited and sovereign, the achievement of these objectives is not in itself sufficient. A repressively Catholic Ireland, or an economically-illiterate Ireland, or an inward-looking insular Ireland, are not what most true republicans want, and any political movement that promotes one is doubly unhelpful to the cause – because that party would lose the support of many true republicans, and because that party would be unable to attract the support of those outside the traditional nationalist camp. Many commenters have pointed out the obvious truth that Sinn Féin is essentially a Catholic nationalist party, and one that remains closely associated with the 30 years of war that Northern Ireland endured. Most resign themselves to the inevitable continuation of Sinn Féin and its seemingly inexorable usurpation of the lion’s share of the nationalist vote. Few – bar the dissident republicans, who exclude themselves from normal political discourse by their continued support for political violence – dare to think the unthinkable, or to say it out loud: Sinn Féin, its history, its members, its methods and its policies, are part of the problem. For Irish nationalism to succeed in its project – and for that project to have been worth the effort – it must be a truly republican project, and as things stand at present Sinn Féin is not. The future of the Irish nationalist project is less certain as Sinn Féin gains in strength. The chance of attracting (ex-)unionist support drops to zero, and even Irish nationalist republicans may drift away into apathy. Sinn Féin is not sacrosanct. It is a political vehicle that succeeded earlier vehicles – the Redmondites, the Parnellites, the Fenians, the United Irishmen … Just as parties or movements grow, they decline and are replaced by others more suited to their times. Sinn Féin’s time has passed, and it is time for Irish republicans to create a new republican party that is neither Sinn Féin nor the SDLP. The latter, though republican in policy is ineffectual in practice. This is something that some SDLP members have clearly realised (including the unfortunate Declan O’Loan). It is time for Irish republicans to start to create a truly republican party – one that robustly supports democracy, inclusion, fairness, tolerance, the rule of law, and that creates the conditions that allow all citizens to enjoy a full and worthwhile life. Of course all parties pay lip-service to such values, but a truly republican party would actually practice them. Let a new party arise – a party that unites Catholic, Protestant, dissenter, atheist and all others is a common endeavour. Let the rump of Sinn Féin co-exist, if for no other reason that to emphasise the difference. And then let the battle of ideas commence. Schoolyard debating stuff, which most parents and teachers are familiar with. ‘Stop that, you boys’, they say, hoping that puberty will kick in soon. But what can be done if the children are – shall we say – somewhat over the normal age of puberty? Now, Arlene, say sorry to Jim. Jim, stop sniggering and tell Arlene you accept her apology. Now go and play nicely. I don’t want to have to talk to you about this again. Ah, if only adult politics was as mature as the playground. The blogosphere has been buzzing with speculation about the future of Dawn Purvis and the PUP since their recent dramatic parting of company. Some of this speculation has even extended to the possibility that it is a sign of, or perhaps a catalyst for, a more fundamental realignment within unionism. Purvis is reported to be a 'left winger' (this blog disagrees, but that is a different argument), and the speculation is whether she could find a home in any of the other unionist parties. The consensus appears to be that she would not be happy with any of them, as they do not match her 'feminist' and 'left wing' principles. While Purvis may simply wander off into a political wilderness, there are many who would like to see her recent discovery of morality as a sign that she has a serious future in Northern Irish politics, and could join with others – some mavericks, others not – to form a new grouping based on left-of-centre politics. A Unionist Labour Party of sorts. Of course, such a 'class-based' realignment of Northern Irish politics has been eagerly anticipated by many people for many years, but has never actually happened. The PUP itself was hailed as a harbinger of change – but failed to prosper, and now its single MLA (who received 80% of all the voters cast for the party in 2007) has walked away. The Holy Grail for many unionists is the participation of the big British parties. They know that their own little parties will never attract Catholic support, and that Catholics will therefore continue to vote for nationalist parties, thus keeping the 'constitutional question' constantly in the spotlight. If the British parties – Labour and the Tories – could be persuaded to set up shop in a serious way in Northern Ireland enough Catholics might be lured away from the nationalist parties to ensure that they never come close to the 50%+1 threshold that unionists so fear. This year the Tories made their most serious effort yet to set up in Northern Ireland – and failed quite spectacularly. But the Tories were never going to attract mass Catholic support – the Catholic community, for historical reasons, is largely statist and would be unlikely to vote for a party that promises a Big Society but a smaller state. The main hope amongst unionism is that the British Labour party – to which most Irish emigrants in Britain gave their votes – would come to Northern Ireland and sweep up large numbers of Catholic votes into what would remain a de facto unionist party. So far, though, that has not happened, and the Mexican stand-off between unionism and nationalism continues. But the absence of the British Labour party, and the clearly nationalist standpoint of the SDLP, has left working class Protestants poorly represented. The DUP takes their votes but provides them with a regressive and reactionary representation. Any working class Protestant looking for a socially liberal party is sorely challenged. A new 'left-of-centre' unionist party would – so goes the theory – provide working class Protestants with a political vehicle that represents their interests. The fact that the proposed party must be specifically unionist is an interesting admission – no one is speculating about the formation of a cross-community left-of-centre party (the old one, the NILP, withered and died years ago). It is an admission that politics in Northern Ireland is played out in parallel in two different communities – as in Belgium – and that the hope of attracting the British Labour party is slim. If 'normal politics' are to be established in Northern Ireland, they must be tailored to Northern Ireland's unique context, it seems. If a new grouping (or even a party) appears in the unionist community it will necessitate changes – there simply are not enough votes for so many real parties to co-exist. In order to have any impact a new unionist labour party would need to take votes from the DUP, the UUP and even Alliance, leaving each of these in danger of defeat in some areas. Proportional representation minimises the potential damage to unionism as a whole, of course, but considerable uncertainty would be added to an already uncertain situation. The new party would clearly have a very Belfast-centric orientation. All of the names being mentioned are from Belfast or North Down, and the PUP's support was almost entirely in those areas. The new party would need to try to broaden its appeal, particularly in areas with significant working class Protestant votes – Coleraine, Larne, Carrickfergus, Derry's Waterside, Ballymena, Portadown, and so on – but these are precisely the areas that provide the DUP with much of its support. More than any other party the DUP has reason to fear any new party. Squeezed between a declining constituency in the 'west' and the challenge of the TUV in its heartland, the DUP cannot afford to lose the Protestant working class vote in Greater Belfast. One possible scenario for the future is that a left-right realignment in unionism leads to the emergence of two parties – a new left-of-centre party that absorbs the PUP, leftist UUP members, and much of the DUP's urban vote – and a middle-class party (the DUP) that represents the farmers and the suburbs, and absorbs the remains of the UUP and sees off the TUV. This second party may be the 'unionist unity' party that the DUP are already trying to create in time for next year's Assembly elections. It would be ironic if they succeeded in finally taking over the UUP only to see a serious new competitor appear, this time to their left. Of course, new dawns are commonplace in Northern Ireland, but revolutions are rare. It is just as likely that nothing will happen – Purvis will become an independent with a short political life, and unionism will continue its self-destructive spiral.